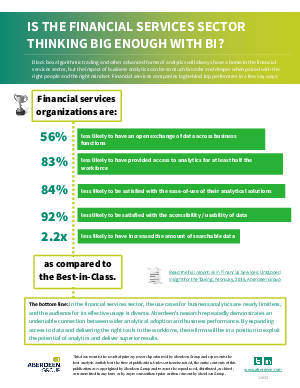 Offers > Qlik > Is The Financial Services Sector Thinking Big Enough With BI? Black box algorithmic trading and other advanced forms of analytics will always have a home in the financial services sector, but the impact of business analytics can be so much broader and deeper when paired with the right people and the right mindset. This research snapshot shows the five critical areas for improvement to unlock further value from analytics.